stone is an earth fast boulder, an approximately vertical face of which forms a side of the cist." Lethbridge p.66. diagram p.65 Ranny Brook Cist 3. Notes: Butler Cairn 7 (Vol 3 54.18). 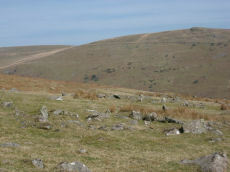 On the summit of Stalldown barrow is a large flat-toped cairn around 17.5m across. 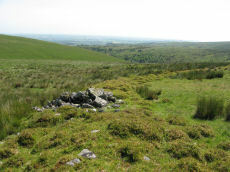 The cairn has been damaged by the construction of shelters within it - hence it is known as Hillson's House. 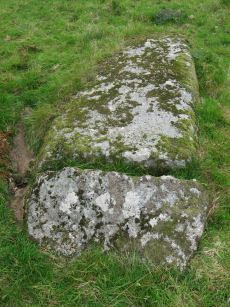 sides of the grave are still in place; the third has been turned back and lies parallel to its original position. 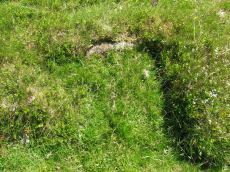 To the south of the cist, and about a foot away from the nearest point of the buried side-stone, lies the displaced coverstone. This stone has a greatest length of four feet and a greatest width of two feet six inches". Sides of cist sunken below surface. Lethbridge p.66. diagram p.65 Cist 2. Notes: Dixon #84. Bar Rep. 58. Butler Ranny Brook N. 3 (Cist 3) - Vol. 3. Map 52.9. (pp.184-7 general plan of Ranny Brook settlements and cairns p.184, diagram of cists p.186). Grinsell CORNWOOD 11. 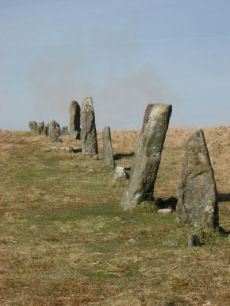 "The northern end-stone and the western side-stone survive, whilst smaller stones may represent the other sides. This agrees with Worth's survey, but in his report he has transposed north and south." Lethbridge diagram p.65 Cist 1. Notes: An enclosure of earth and stone walling 0.5m wide by 0.4m high encompasses an oval area 18.0m by 16.0m. It lies on the South facing slope to the North of Ranny Brook. Scheduled: Devon 10853. Notes: Butler Cairn 1 (Vol 3 54.18). Turner D26 (Type Diii 'Ring Setting with Central reduced to subsoil level or paved'). Cairn in middle of length of stone row. 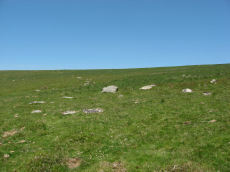 "The northern part of the row is aligned precisely in the centre of the cairn circle, both of which would therefore seem part of the original design. The cairn is not visible from the south end of the southern extension of the row. 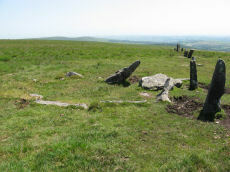 This extension consists of four general alignments more of which focus on the cairn circle, and the northern end of the extension is tangential to the west side of the circle. These factors, and the larger size of the stones in the northern extension of the row, suggest two phases of construction." Notes: Turner F22, Type Fii cairn with double or multiple ring. Butler Cairn 3 just to the west of the stone row, Butler Cairn 4 is just to the east. 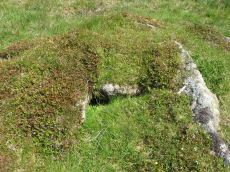 A flat topped turf-covered cairn 9.0m in diameter and 0.7m high, in good condition. 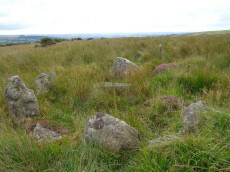 Settings of Stones in and around the structure suggests a complex cairn circle. Notes: Turner A4. 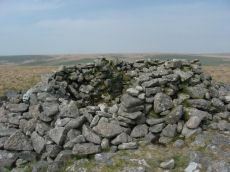 Butler Cairn 6 (Vol 3 54.18). 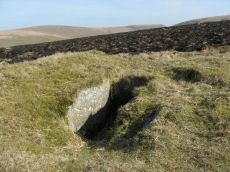 A circular turf-covered stone ring on the summit of Stalldown Barrow hill. It is 25.5m in diameter, comprising a bank of small stones, 2.0m to 3.0m wide and 0.2m to 0.7m high. There is a 5.0m gap in the south-west but no evidence of disturbance to the interior or of a surrounding ditch. Not far to the east is Hillson's House. Notes: Turner E17. Dixon #39. Bar Rep. 37. Butler Stalldown N. (Cairn 9) - Vol. 4. Map 54.18.9 (diagram p.62). Grinsell CORNWOOD 13. "A cist measuring 2 feet 3 inches wide at the south end, 1 foot 7 1/2 inches wide at the north and probably originally 3 feet 6 inches long. Both the coverstone and the north end stone are missing. 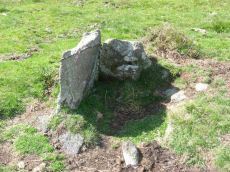 The cist stands in a barrow which has a retaining circle, five stones of which are still erect, and one fallen. The largest stone is 3 feet 4 inches wide by 2 feet 7 inches high. The diameter of the retaining circle varies from 20 to 22 feet". Lethbridge p.69. diagram p.65 Cist 5. Notes: Turner E30. Butler Stalldown W. (Cairn 11) - Vol. 4. Map 54.18.11 (p.61-2 diagram p.62). Grinsell CORNWOOD 11c. "This small round cairn, diameter 5.7 to 6.4m, height 0.5m, is built of small boulders ... 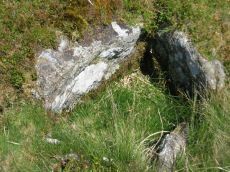 It contains a cist, the south side stone, 1.2m long, both end stones, 0.4m long ...On the south side of the cairn 3 large stones, 0.8m to 1.0m long and set on edge are the probable remains of a kerb". Lethbridge pp.65-67. diagram p.65 Cist 4, photo p.67. Notes: "A fine example of enclosure and hut circles. Extensive prehistoric settlement area. Two villages contiguous, the larger pound a development of the smaller. Pound walls and those of huts consist of stone and turf. At least 22 huts within the enclosure. To the north and south of the pounds are scatters of isolated huts generally much larger than the enclosed huts. On the south there are remains of fields or paddocks. Rough moorland."